Madrid, 5th of July, 2018. The Spanish Association of FinTech and InsurTech (AEFI) celebrated its first edition of FinTech Women Network, a networking event created with the purpose of encouraging female talent in the financial-technology sector, and recognizing the role of women in the development of innovative solutions. 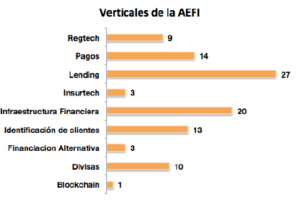 During the encounter, AEFI presented the first statistics of women in the FinTech sector, results of their own investigation elaborated with the help of 125 FinTech and InsurTech startups that are members of the association, including MYMOID. About 28% of all employees in the FinTech industry are women. Of them, 48% are Managers, 36% hold other leading positions, and only 2% are CEOs. Women in FinTech have an average age of between 32 and 36 years. Women with highest demand in the sector have degrees in Business Administration, MBA, or are specialized in Digital Marketing and Communications. According to the study carried out by AEFI, the Lending sector is the vertical that employs the highest number of women (27%), followed by Financial Infrastructure (20%), and Payments (14%). The Verticals of Alternative Financing, Insurtech and Blockchain are still behind in female employment, with a percentage of 3% for the first two categories, and only 1% for the Blockchain sector. The study discovered that about 54% of all surveyed women believe that the FinTech industry offers a greater flexibility when it comes to occupying higher positions compared to other financial sectors, and around 80% agree that they have the same career opportunities as men. Additionally, approximately 80% of all women highly value the flexibility and the disruptive mentality that the sector offers, confirming that this helps them have a better work-life balance. As a member of AEFI and a representative of one of the Verticals that employ the highest number of women in the sector, at MYMOID we are proud to operate in a disruptive sector that supports female talent and offers a modern and flexible environment for innovation. We kindly invite you to discover our payment solutions and have a discussion over the digital transformation lead by men and women in FinTech startups.